Ballantyne Housing Market Update/Video Decemberr 2018. December home sales in the Ballantyne (28277 zip code) area of Charlotte, North Carolina saw a big shift from trends year-to-date and as compared to December 2017. Sales prices were down, days on market were up, inventory was up, as was the months supply of homes. It remains to be seen if this was a one-month phenomenon or the beginning of a market shift. 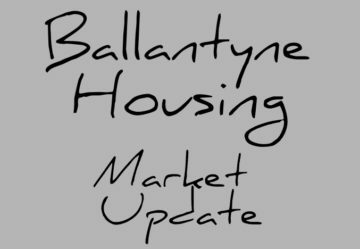 Ballantyne Housing Market Update/Video November 2018. November home sales in the Ballantyne (28277 zip code) area of Charlotte, North Carolina saw the same trends we’ve been seeing all year with home prices up. Inventory remained tight and new listings decreased during the month. Closed and pending sales up, but not significantly, due to limited affordable inventory and rising home prices and interest rates. Ballantyne (28277 zip code) housing market information updated for October 2018. October home sales in the Ballantyne area of Charlotte, North Carolina saw the same trends we’ve been seeing all year with home prices up, inventory tight but increasing, closed and pending sales diminishing due to limited affordable inventory and rising home prices and interest rates. Ballantyne (28277 zip code) housing market information updated for August 2018. August home sales in the Ballantyne area of Charlotte, North Carolina saw the same trends we’ve been seeing all year with home prices up, inventory tight, closed sales diminishing due to limited inventory. Ballantyne (28277 zip code) housing market information updated for July 2018. July home sales in the Ballantyne area of Charlotte, North Carolina saw the same trends we’ve been seeing all year with home prices up, inventory tight, pending and closed sales diminishing due to the lack of new listings and inventory.